Dan Bloomer joins our 2019 Field Walks and is talking through the Page Bloomer/LandWISE project, FUTURE PROOFING VEGETABLE PRODUCTION, which covers the effectiveness of fertiliser and water application techniques. As public and government concern grows about nitrate leaching, this project will be an invaluable resource for farmers and the accountability that may arise for our industry. I have used Page Bloomer Associates’ recent reports, to summarise some of the outcomes so far. 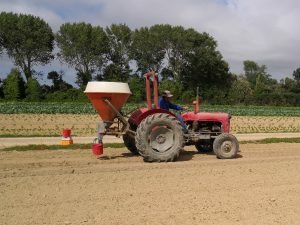 One of the key areas within the FPVP Project is fertilizer application, with the aim of improving accuracy. Performance assessment in the project’s testing, provides information which can ensure fertilizer is applied evenly and minimizes the risk of leaching from over-application. This means economy & sustainability. More bang for your buck! Both direct application and broadcast spreaders were assessed. the target rate is often not achieved, due to over/under applying. equipment outlets are not applying at equal rates (equipment maintenance can affect this). equipment does not apply consistently in several tests (older, worn, manually operated equipment appear to be problematic). volume/weight of fertilizer in the hopper, appears to affect the application rate. As the volume empties, the application decreases. Broadcast spreading is less common and so fewer tests were conducted. Results indicated the method was not achieving acceptable spread. Settings or bout width may need to be changed and assessment services are available through companies such as Spreadmark and Amazon. The project’s irrigator assessments show there is room for improvement in their performance too. Growers have been highly engaged and developed their awareness, throughout the project. Workshops are planned prior to next growing season, on how to calibrate equipment and use the reports and are highly anticipated by growers who have participated in project testing so far. Throughout the project so far, growers have been supported and heavily involved in the testing and grower feedback has helped the researchers gain insight into strategies and difficulties to be faced. Knowledge has flowed in both directions, a truly collaborative approach. Other areas in the project cover the Overseer software, Nitrate-strip testing, liquid and granule fertilisers. Potatoes New Zealand is proud and excited to support this important project and we anticipate it’s value for our growers moving forward.